All materials will be supplied as part of the course fee, so all you need to bring is a sense of adventure and fun! Louise is a local resident and artist who has a particular interest in working with adults who experience mental health difficulties. A five week Silk Painting Course will follow the Taster Sessions commencing on Sat 23rd February and Sat 25th May (10.30am – 2pm) and is open to both the artistically nervous and more experienced art makers, who would like to return to creativity or simply explore something new! Learn the basic principles of Silk Painting and begin to experiment with texture and different silk painting techniques. Put your new skills into practice to create a beautiful and unique floral image. 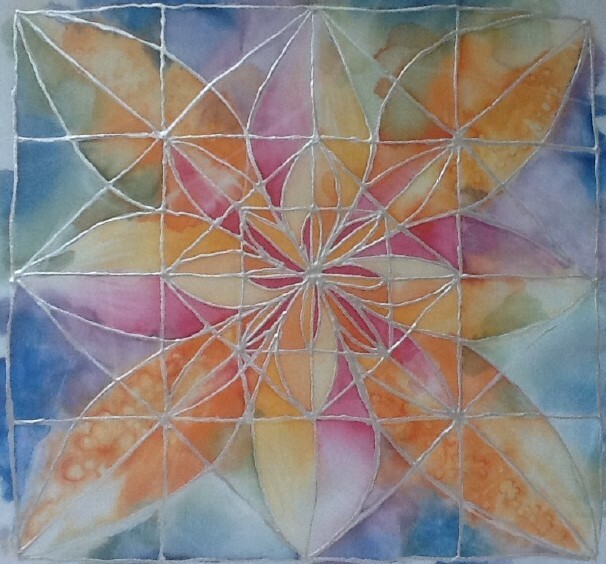 Explore colour and develop technique with this popular and ‘trending’ theme using a found image or design a mandala of your own! All about pattern! Time to test your skills with a more challenging design that can be tricky, but looks amazing! Put everything you have learned together to create your own original art work. A chance to experiment with a unique idea or revisit a theme previously covered that you best enjoyed! There is also an opportunity to attend optional Extension Classes following completion of the course and/or purchase discounted Silk Painting materials if you’ve been bitten by the bug!